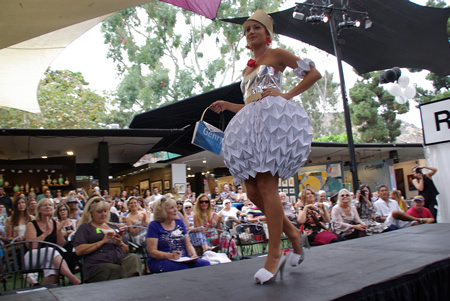 The sixth-annual Runway Fashion Show at the Festival of Arts astonished spectators with garments re-imagined from used, re-used and recycled items worn by gorgeous, sensuous models. Artist exhibitors, who devised the innovative designs, earned $1,000 prizes in four categories and the People’s Choice Award. Most creative concept went to Brad Elsberry shown on the runway by Erika Baldwin. 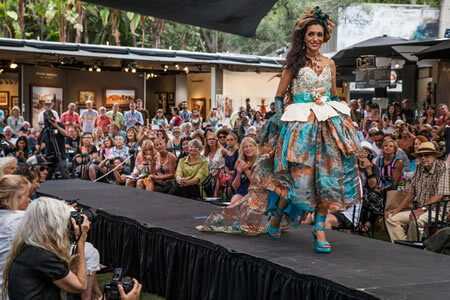 Most Glamorous choice went to Adam Neeley for his “Oceana” modeled by Alicia Chavex; his creation also won the People’s Choice award. Sculptor Antje Campbell won for most innovative use of materials, modeled by Emily Knutson. Most wow factor went to watercolorist Kirsten Whalen’s ensemble, modeled by daughter Erika Shindele. Photo by Loreen Berlin. 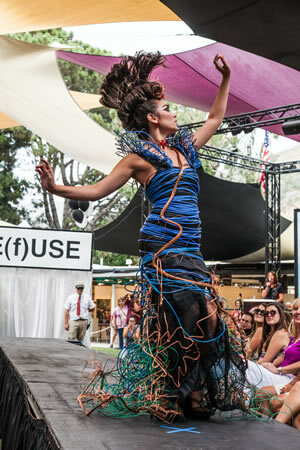 The most creative concept went to painter Brad Elsberry and model Erika Baldwin for his remarkable creation of a wire evening gown and headdress under a draped long black cape. Most exciting ensemble was awarded to watercolorst Kirsten Whalen, whose model, daughter Erika Shindele, wore a tight-fitting fabulous black bodice and black full-skirt lined with road maps accented with a fan of maps. Most innovative use of materials was presented to sculptor Antje Campbell and model Emily Knutson, inspired from German Gehry building designs. The outfit of steel, glass and wood pushed the comfort zone of materials with its paper skirt, veneer belt and bodice of Trader Joe’s potato chip bags. Most glamorous and the people’s choice award went to Adam Neeley’s “Oceana” modeled by Alicia Chavex, inspired by the beauty and tranquility of the ocean with hand-crafted burlap, flowers and shells and a necklace of cork representing ocean waves. Fashion critic Steven “Cojo” Cojocaru entertained throughout the three-hour presentation, which included a second runway look at the original fashion statements. A second runway show featured original t-shirts by students from the Laguna College of Art and Design, emceed by Jonathan Burke, the college president. The student designs modeled Saturday were part of a class project within the college’s action sports program, which includes apparel and footwear design. 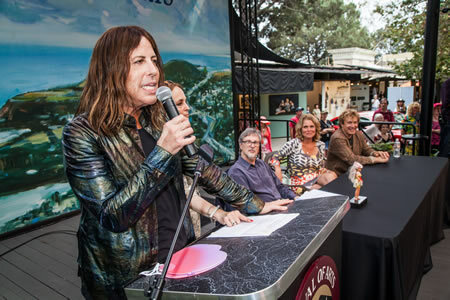 The six-year-old program attracted partnerships from Vans, Hurley and Nike and this year the Thalia Surf Shop. Despite a few moments of uncharacteristic drizzle, the spirit of the event was not dampened by the unexpected sprinkles.